How would you like to have a flashlight and lantern all in one device? 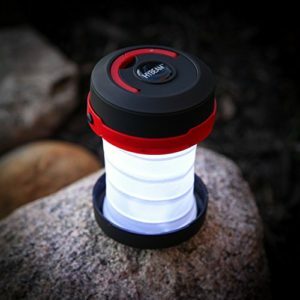 In this Hybeam Pop Lamp Lantern and Flashlight review you will learn how useful this multifunctional light can be on your next camping trip. We love gadgets and a popular but crafty gadget you’ll love for your next camping trip is the Hybeam Pop Lamp. This versatile light comes in handy in all the right ways. It’s a 2-in-1 light that operates as a flashlight in its condensed state the size of a hockey puck but with a simple twist and unwinds into a lantern that will brighten up the entire room. On Amazon.com the Hybeam LED Pop Lamp has over 50 customer reviews and customers have rated the product a 4.5 out of 5 stars. You’ll find the best deal online at Amazon.com. Click here for the best prices on this product. Brightness: The Pop Lamp uses a Cree LED bulb that shines bright at over 300 lumens. This flashlight shines brighter than most ordinary flashlights. Collapsible: This light starts out as a hockey puck sized flashlight that you carry with your fingers, it sits in the palm of your hand. With a twist you can transform the flashlight into a collapsible lantern that can sit in a corner or be hung up. It’s provides more than enough light for a tent or room. Construction: It’s designed to be durable and weather the outdoors. The light is all weather resistant, able to withstand rain, sleet, and snow. Flashlight Modes: There are 3 mode settings for the flashlight which are high beam, low beam, and strobe. Batteries: It uses rechargeable batteries which will last up to 36 hours and AA batteries are also compatible with the Hybeam but it may not be as bright as the rechargeable batteries. This arrived in a tiny box. I was really surprised to see how small this lantern collapses. This light is extremely bright. It easily lit my whole living room (22 x 56). This is one of the greatest inventions and devices! It comes folded up and is about the size of your palm. It is one of the best camping accessories I have found in a while. You can use it a few different ways, it can be kept in a folded down closed position (which is great to save on space) and used as a flashlight, or unfolded into the lantern position where it can be all the way on, dimmed, or strobe light.